Accra, April 13, GNA - Adama Mensah, former African Boxing Union (ABU) heavyweight champion has said that the Ghana Amateur Boxing Association (GABA) as it is currently constituted lacks ideas to develop the sport and must therefore quit to give other people the chance to oversee its development. Speaking to the GNA Sports on Tuesday, the former champion who was also a World Military Games gold medallist and a Commonwealth Games silver medallist in his amateur days said the mere fact that no Ghanaian boxer has qualified to fight at the Athens Olympic Games is enough reason to make the officials throw in the towel. He blamed managerial and technical reasons for the downward trend in amateur boxing saying, "we cannot expect to produce good boxers if those responsible for their training are people who have never boxed but are those who learn about boxing from books." The former champion said there is a pool of distinguished former boxers who are capable of coaching the young ones and called on the Ministry of Education Youth and Sports and the National Sports Council to take the necessary steps to ameliorate the situation. "Peter Asandoh, Baba Sumaila, Azumah Nelson, if he has the time and I have the experience and the know how to groom a formidable team to fly the flag of Ghana but the system has failed to recognise our usefulness." 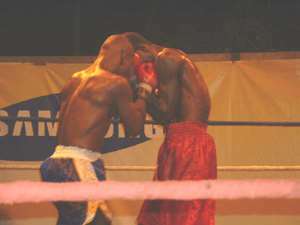 Adama said the development of boxing in every country depends upon the kind of amateur boxers the country produces and called on the appointing authorities to put those who love the sport and will be capable of rallying support from the business community, international sporting agencies and kit manufacturers to develop the sport. He said apart from generating and sustaining the interest of the youth in boxing through regular tournaments, a proactive GABA must endeavour to provide the youth with training equipment either from government resources and or from corporate organisations and allied developers from within or outside the country. The former champion said he was disappointed that the Security Services Sports Association (SESSA) Games, which were reintroduced this year after a long break did not include boxing and wondered why the prime combat sport in the world was not accommodated on the schedule of events. "I expected GABA to complain but instead they kept quiet, knowing very well that the inclusion of boxing will compel the security services to recruit boxers and that will help quicken the development of the sport." He advised the organisers of the SESSA Games to include boxing in subsequent editions and recruit boxers regardless of their level of education "because most of the talented boxers are school dropouts who learn the art at the beaches or in the slums and need no formal education to become great boxers." Adama said though amateur boxers are not expected to receive monetary rewards the GABA could liase with some corporate organisation to present them with their products from time to time as a way of encouraging the young boxers. "I was given a piece of cloth by Akosombo Textile Limited after my first amateur fight against Dodoo Wellington in 1974 and Archie Moore, a former world light heavyweight champion who watched the fight gave me 10 dollars even though I lost. "The gifts inspired me to train hard and realise my potentials and three years later, I won the gold medal at the African championship and later the gold medal at the All Africa Games in Algiers. Adama called on those at the helm of affairs to institute awards for distinguished sportsmen and women, as it would spur the youth to strive hard to achieve greatness in their various fields of sporting endeavour, adding that despite his laudable achievements in the ring he has not received any honours.